My older son is a potato addict. I can’t blame him really, I was the same as a kid. Potatoes are delicious any way: baked, whipped, pureed, mashed, fried, or shredded. Seriously, any way works for him. I don’t eat them as much anymore, so when I do, they need to be worth it. Potato latkes are absolutely worth it. 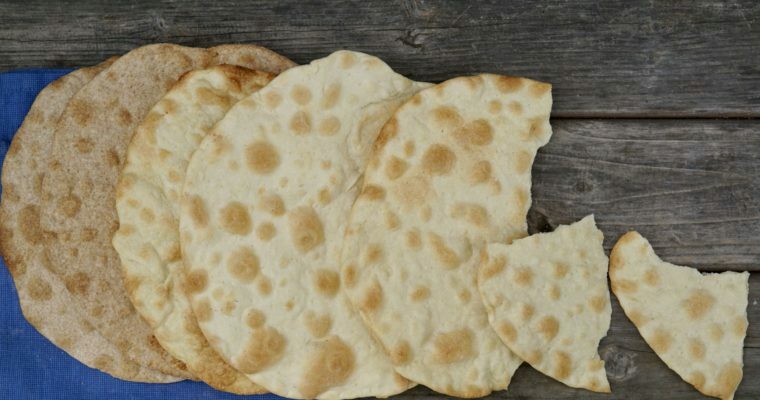 To me, they are the ultimate Jewish comfort food and in my house, we make them all year-long. Latkes, a fried shredded potato pancake, are a traditional Jewish dish served during the Hanukkah holiday, something my husband grew up eating each December. I grew up eating potato pancakes made from mashed potatoes, seared in a pan with melted butter to obtain a crispy outer area. I loved them deeply. I have had many latkes and potato pancakes in my life. My recipe here is almost a blend of what my husband and I grew up eating. My older son has called these “perfection,” a compliment coming from a tween that I will gladly accept. So, why do Jews eat latkes (and donuts) fried in oil during Hanukkah? Latkes and donuts are fried in oil as a way to pay homage (or celebrate) the miracle of the Festival of Lights. Depending on what you read, there were a number of miracles relating to the rededication of the Holy Temple of Jerusalem in the 2nd century BCE. One typically taught to children is that a single night’s supply of lamp oil provided light for eight nights. Because it typically falls near Christmas, Hanukkah has received more attention than many of the other Jewish holidays. But Hanukkah is actually considered a minor holiday on the Jewish calendar, and it was added to the Jewish calendar relatively late. In addition to oil, latkes are all about potatoes. 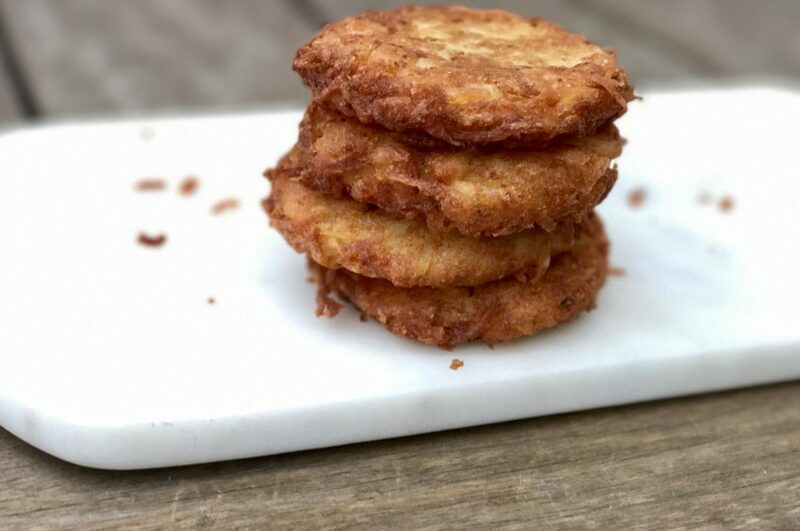 The mix of partly shredded and partially blended potatoes in my recipe help the latkes stay together and fry up perfectly golden brown but moist in the middle. This balance allows for you to make this recipe in advance and reheat in the oven without them drying out, which is ideal for large gatherings like one sees at a Hanukkah celebrations. This recipe makes twelve latkes, and I say serves 4 people—that, however, does not work in my family. I typically double or triple the batch because no one really wants to say “no” to having one more latke. 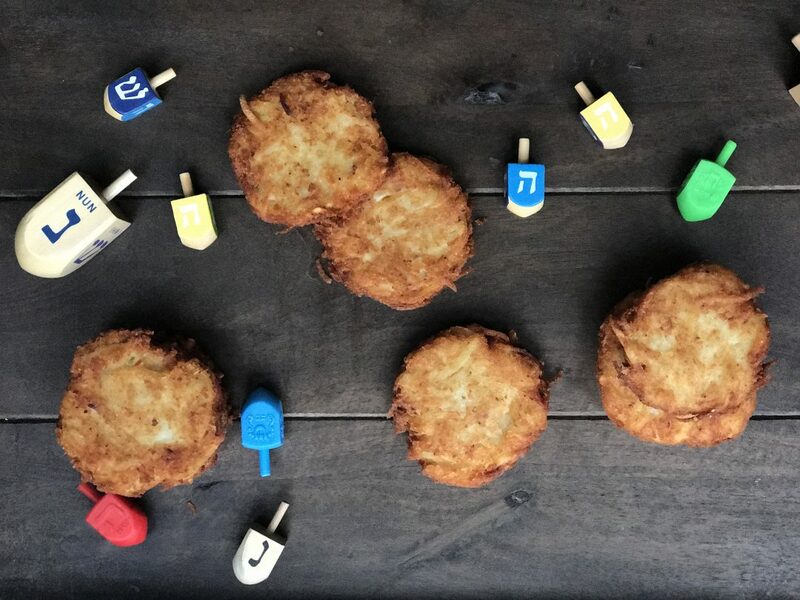 Latkes are incredibly versatile and not just for Hanukkah. These tasty savory cakes work well as a side dish to almost anything you can think of. 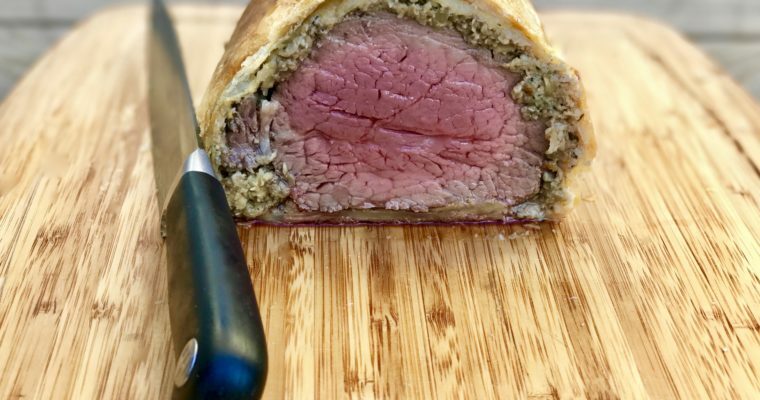 Great for entertaining, cooked in advance and easily reheated in the oven to maintain their wonderful crispiness. Serve with traditional apple sauce and sour cream or straight up, these latkes are absolutely delicious. Step 1 Preheat the oven to 300 degrees F. Line a baking sheet with paper towel and set aside. Step 2 Using a food processor, such as a Cusinart, fitted with a metal shredding blade, shred the potatoes and place in a large mixing bowl. Step 3 Shred the onion and add to the potatoes. Step 4 Add the egg and panko to the potato-onion mixture and using your hands, mix well to incorporate. Add the salt and let sit for a few minutes. Step 5 Using your hands again, take about ¼ cup potato mixture and squeeze tightly in your hands releasing the water while forming it into a round patty. Place on a plate and continue making till all 12 patties have been formed. Step 6 Place a large sauté pan over medium-high heat and add a generous amount of oil. When hot, but not smoking, add the first batch of latkes. Be careful not to overcrowded the pan. Cook the latkes for about 5 minutes until you see nice golden-brown coloration. Using a metal spatula, carefully turn the latkes and cook for an additional 5 minutes. Remove from the pan and drain on the prepared baking sheet. Step 7 If needed, add some additional oil to the pan and allow to heat up. Cook the next batch of latkes as you did the first. Step 8 Remove the paper towel from the baking sheet and place the latkes in the oven to heat completely before serving. Step 9 Serve the latkes with sour cream and apple sauce for dipping. 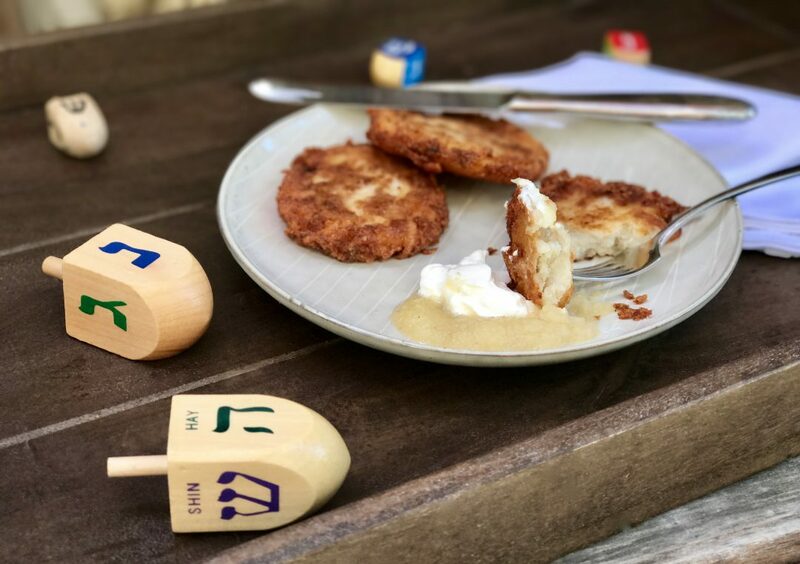 I am happy you enjoyed my potatoe pancakes growing up – and happy you have turned them into your special Latkes for all to enjoy, especially Eli! Happy Hanukkah, Love, Mom.